As well as her new NGO coordinater role, Wragg heads the WAVE’ Climate Change committee, which promotes information sharing and awareness of gender issues in climate change and Pacific development. She will team up with three other women from around the world for the Global Climate Change Alliance’s (GCCA) high profile campaign in the US. The other women from Uganda, Cataret Islands in Papua New Guinea and the Mississippi in the US will include media interviews and events running parallel with the United Nations General Assembly this month, as part of their two week campaign. Wragg, who lives in a coastal area of the Cook Islands capital, Rarotonga, was part of a global 'climate witness' campaign featured by Greenpeace this year. 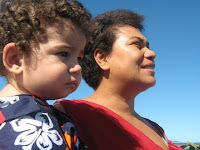 As a journalist able to report 'from the inside' and travelling to the outer islands of the Cooks, she says she has been "touched and impressed" by the experiences of rural and low-income families living with the impacts of coastal erosion, and water, crop and other food security issues. She says this has given her the conviction to speak out and use her media skills to help call attention to the growing climate change sector of the need to capture the issues of those who often don't have a voice amongst or access to the leaders who make the decisions at global meetings on the environment. “My small islands story is just a big part of the Pacific experience. The saddest part for all of us, and especially for rural families and the poor, is that we have yet to see concrete evidence that the impact on women of all these policies is being taken into account," she says. "At a time when the whole world is turning its attention and funding to climate change, it is critical that we seek the the great solutions women can share if only we get the space at the leaders and planning tables." "It's ironic that the Pacific region is the most innocent in this man-made catastrophe, yet we are the ones paying the highest price,” Wragg said. "Creating WAVEs of change for Pacific futures"